He and I both recognize the wonderful benefits that observational, operational science has brought us, from cell phones to space shuttles. But operational science, which builds today’s technology, is not the same as presenting beliefs about the past, which cannot be tested in the laboratory. Most students are presented only with the evolutionary belief system in their schools, and they are censored from hearing challenges to it. Let our young people understand science correctly and hear both sides of the origins issue and then evaluate them. Our public schools arbitrarily define science as explaining the world by natural processes alone. In essence, a religion of naturalism is being imposed on millions of students. They need to be taught the real nature of science, including its limitations. Nye, the host of a popular TV program for children, should welcome a scrutiny of evolution in the classrooms. As evolution-creation issues continue to be in the news - whether it relates to textbook controversies or our debate - there is an increasingly bright spotlight on the research activities of thousands of scientists and engineers worldwide who have earned doctorates and are creationists. On our full-time staff at Answers in Genesis, we have Ph.D.s in astronomy, geology, biology, molecular genetics, the history of science, and medicine. Yes, creationists are still a small minority in the scientific community, but they hold impressive credentials and have made valuable contributions in science and engineering. I remember the time I spoke at a lunchtime Bible study at the Goddard Space Flight Center near Washington. I was thrilled to meet several scientists and engineers who accept the book of Genesis as historical and reject Darwinian evolution. They shared with me that a belief in evolution had nothing to do with their work on the Hubble Space Telescope. Why should our perspective about origins be censored? Our young people — and adults — should be aware that considerable dissent exists in the scientific world regarding the validity of molecules-to-man evolution. It’s an important debate, for what you think about your origins will largely form your worldview. If you believe in a universe that was created by accident, then there is ultimately no meaning and purpose in life, and you can establish any belief system you want with no regard to an absolute authority. Ultimately, I have decided to accept an authority — our infallible creator and his word, the Bible — over the words of fallible humans. 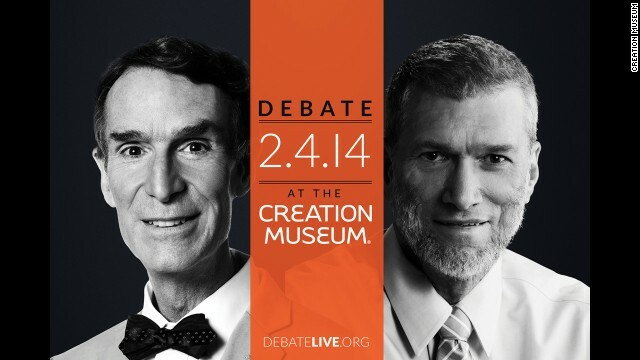 Ken Ham is founder and CEO of Answers in Genesis (USA) and founder of the Creation Museum in Petersburg, Kentucky. The views expressed in this column belong to Ham. « Previous entryA father’s dilemma: Is watching football immoral? It is time to replace all religions with a few rules like "Do No Harm" and convert all houses of "worthless worship" to recreation facilities and parks. • A constant cycle of reincarnation until enlightenment is reached and belief that various beings (angels?, tinkerbells? etc.) exist that we, as mortals, cannot comprehend makes for a no on Sikhism.